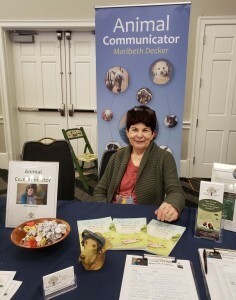 Meet Maribeth Decker - An Interview with Joan Ranquet | Sacred Grove: Intuitive animal communication & energy healing; Alexandria, VA. I recently had the opportunity to sit down with Joan Ranquet, my animal communicator mentor, to discuss my experience as a graduate of CWALU – Communication with all Life University. Portions of the interview and the link to the full video are below. I hope you enjoy! JR: What drew you to the program? MD: I already had extensive training in animal communication, telepathy and energy healing and was working with animals. But I felt the need to hone my skills and do more in-depth work in a few areas. I wanted to work with a strong, experienced teacher who had a program that could lead to certification. JR: Are you an animal communicator/energy healer now? MD: Yes, I was doing this professionally before I started working with CWALU and Joan Ranquet. JR: If you are out there as an animal communicator or an energy healer, what does your day look like? MD: I’m doing remote sessions from home (have clients all over the country), speaking at Expos, in pet stores and on podcasts as well as doing workshops at a metaphysical store. You’ll also find me on Facebook doing live videos and hosting my Spiritual Pet People group. I do a lot of blogging, too since I love to write. JR: Is it helping with your animals at home? MD: Absolutely. And I’ve got five animals, 2 dogs and 3 cats. I now more tuned into my animals’ physical and emotional needs. We discuss family issues (I am serious! ), and I ask everyone to show more love and consideration for each other when there are issues. Then I throw in some energy healing to smooth the way. What I didn’t expect is I have more appreciation for who they are and from that place, we all seem to get along better. My husband’s picking up on this dimension too. He clearly heard our kitten ask to come home with him when he was in the pet store – she said she was tired of living in cramped spaces. I don’t know if it’s a coincidence, but he brought her home when I was at CWALU training last fall. JR: What would you have to say about Joan, CWALU and/or Joan’s teaching? MD: Joan’s teaching and CWALU is based on 20+ years of experience. She has always focused on animal communication and energy healing for animals – it’s not a side gig or a small part of her business. It’s her focus. She has trained with some astounding people like Dr. Norm Shealy and Carolyn Myss. The written/video resources in CWALU are almost overwhelming, there’s so much. But I’m not complaining. Joan’s a down-to-earth and enjoyable teacher with a great sense of humor. Her storytelling is intrinsic to her teaching. She provides feedback to improve your work in a way that you can take it in and grow from it. Not everyone has that ability! Finally, CWALU attracts a wonderful group of people who are serious about honing their skills. So the energy of the training sessions are pretty high vibe!